King Cashalot is another of Microgaming’s progressive slots and owns a huge jackpot in comparison to the small amount it costs for a maximum bet spin. The ever-increasing jackpot expands every time a real money bet is placed on the game anywhere within the linked Microgaming network, and the game can be played at Royal Vegas Casino. A theme based on the medieval kings and queens, and the luxury and leisure shared by the royal hierarchy during those times, this five-reel and nine pay-line pokie is simple to play and offers great bonuses. Maximum bet: nine pay-lines x five coins = $2.25 (max amount must be staked to win the jackpot). Wild symbol: yes (the King) – substitutes for any symbol to create a winning pay-line, except scatter and bonus. Doubles (x2) your win when substituting. Scatter symbol: yes (the Jester) – wins are added to pay-line wins. Two or more scatters anywhere across the five reels pays out (wins are multiplied by total number of credits staked). Bonus symbol: yes (the Dragon) – if the Dragon appears on reels two, three and four from one spin, the bonus round is triggered (see below). Starting price of progressive jackpot: $100,000 (with no upwards limit). In order to win the progressive jackpot, you must play all nine pay-lines and bet the maximum number of coins per line (five). This will cost you $2.25 per spin, which is quite small compared to the huge jackpot on offer, which can creep in to the millions. Five Kings on the ninth pay-line with the maximum bet staked will win you the jackpot. When the bonus round is triggered (Dragons on reels two, three and four), the player is given a choice of one of eight treasure chests to choose from. 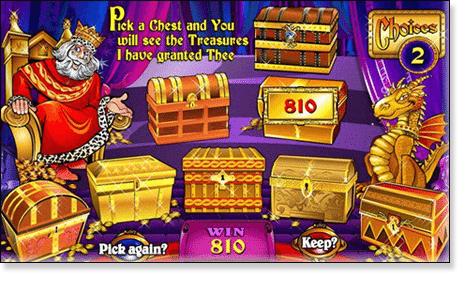 Whatever is in that chest is yours to keep, and your winnings are multiplied by the number of coins staked per pay-line, and the number of lines bet. All bonus wins are added to regular pay-line wins. You may choose to either keep your selection or opt to pick another chest if unsatisfied with your original choice, but beware – you could lose everything. The following symbols all net payouts if multiples are spun to form a winning pay-line: the King, Queen, Knight, Damsel, Jester, turkey, ham, fish, pudding and fruit. Only the highest win is paid per selected pay-line, and all wins pay left to right except for the scatter symbol which pays any. All wins are multiplied by the credits staked per line (except scatter). All wins are for five, then four, and then three symbols spun, unless otherwise stated (wild and scatter). Play the King Cashalot progressive jackpot pokies game at Royal Vegas Casino, where new players can claim up to $1200 in matched deposit welcome bonuses.